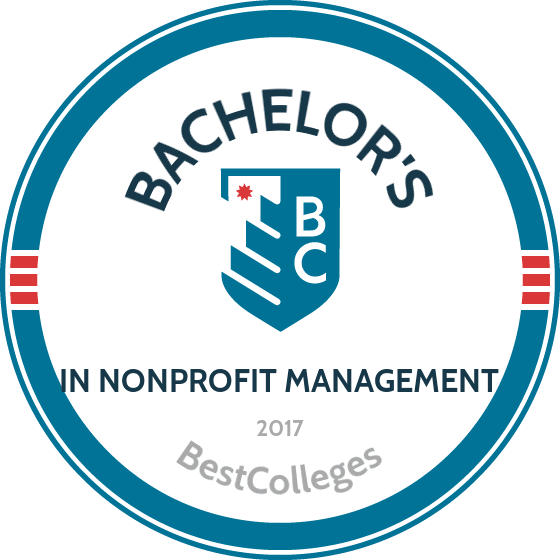 What Are The Best Online Bachelor's in Nonprofit Management Programs? What Will I Learn in an Online Bachelor's in Nonprofit Management? Nonprofit organizations serve the needs of particular groups or communities through research, advocacy, philanthropy, and social services. Since the resources of these organizations are limited, much of their work depends on financial acumen and strategic thinking. By earning an online bachelor's degree in nonprofit management, you can give nonprofits the skills they need in areas like business administration, accounting, and entrepreneurship. According to the U.S. Bureau of Labor Statistics, nonprofit managers may earn a wage premium compared to their for-profit counterparts, and the demand for social and community service managers is expected to grow 10% in the next seven years. An online bachelor's in nonprofit management allows you to make a real difference in the world while working in an industry with great employment and salary prospects. City Vision offers an online bachelor's degree in nonprofit management that prepares students for careers in religious and educational institutions, rescue missions, social service agencies, foundations, and ministries. The 120-credit curriculum requires students to complete ten courses from a list of major classes on topics such as nonprofit administration, facilities management, fundraising basics, financial planning for nonprofits, grant writing, and organizational systems. Courses are delivered asynchronously, allowing students to complete coursework at their own pace. City Vision will accept up to 90 credits in transfer from accredited colleges and universities. Students with unaccredited ministry training or experience may also transfer a maximum of 30 credits towards their degree by passing an examination. The school provides 25% tuition discounts for military service personnel, veterans, and staff at rescue mission and in the Salvation Army, as well as a 50% discount for ministry interns. City Vision is accredited by the Distance Education Accrediting Commission. SNHU is one of the nation’s leaders in distance learning for nontraditional students. The school offers an affordable bachelor’s of science in business administration with an emphasis on nonprofit management. This online bachelor's degree in nonprofit management includes 120 credits of coursework and offers courses in six eight-week terms each year. There are 75 credits of general education requirements and 45 credits of core business classes on topics like management, accounting, grant writing, fundraising, human resources, and entrepreneurship. Courses are delivered asynchronously online, allowing students to complete coursework at their own pace. SNHU offers a 30% tuition discount to members of the U.S. military and their spouses. Transfer students can apply up to 90 credits earned at another accredited institution towards their degree. SNHU is accredited by the New England Association of Schools and Colleges. Toccoa Falls is a private Christian institution that was founded in 1907 in northeast Georgia. The school offers a nonprofit management degree that is ideal for working professionals. This fully online degree consists of 126 credits of coursework, including 72 credits of general education requirements and 54 credits in specialized major courses. The curriculum includes courses on a variety of topics, such as nonprofit ethics and social responsibility, philanthropy, nonprofit marketing, and servant leadership. Graduates are prepared to pursue careers in nonprofit organizations in a growing number of social services, government, non-government, and faith-based institutions. Non-traditional students working full-time may qualify for significant tuition discounts. Emergency first responders are eligible for a 50% reduction in tuition and online students employed full-time in Stephens and Habersham counties may receive their third course free. Toccoa Falls is accredited by the Southern Association of Colleges and Schools Commission on Colleges. Huntington offers an affordable nonprofit management degree online in an accelerated format. This online bachelor's degree in nonprofit management is ideal for nontraditional students who want to begin careers in this rapidly growing field. The 128-credit program includes 51 credits of major coursework and a required business capstone project. The remaining credits are drawn from the core curriculum and elective courses. Students need to complete a minimum of 50 credits prior to entering this bachelor's of science program. The curriculum includes courses on a variety of topics, such as business management, accounting, organizational behavior, leadership, law, marketing, ethics, grant-writing, and public relations. Courses are delivered asynchronously online, allowing students to complete coursework at their own pace. The school works with adult learners to translate their work and life experiences into colleges credits that can be applied toward graduation. Huntington is accredited by the Higher Learning Commission. Bellevue boasts a reputation as an affordable university that offers a variety of online and accelerated degree completion programs that are ideal for adult learners. The school offers a bachelor’s of science program that is unique among nonprofit management degree programs for its emphasis on nontraditional students who already have professional and personal experiences that can be applied in their studies. The 40-credit curriculum emphasizes key areas in nonprofit management, including grant revenue generation, financial management, and non-governmental organizations. All students must also complete nine credits in the university’s Kirkpatrick Signature Series of courses on vision and values, tradition and change, and freedom and responsibility. Applicants must have an associate degree or have completed 60 hours in transfer credits to be considered. They must also be currently employed or have previous work or volunteer experiences. Bellevue is accredited by the Higher Learning Commission. Introduction to Nonprofit Organizations: In this course, students learn about the diverse range of nonprofits operating across the United States, from public policy think tanks to private philanthropies. The course also covers the history of nonprofits and the legal and regulatory environments in which they operate. Grant Writing: Nonprofit organizations constantly apply for grants from public and private institutions. This course on grant writing teaches students how to pitch fundable projects, identify potential sponsors, and write effectively. Students also learn how to create budgets, propose programs, and engage in peer review. Business Ethics: This course on ethics and ethical decision making introduces students to moral dilemmas often encountered by nonprofit managers in the field. Students also apply ethical paradigms to current events and investigate how nonprofit organizations can make positive interventions. Volunteer Management: The dynamics of governance are taught in this course. Students learn the roles of various members of the nonprofit community, from executive directors and trustees to volunteers and constituents. The objective of this class to understand how to maximize volunteer contributions and maintain organizational effectiveness. Identifying schools that are properly accredited is an important part of selecting the right nonprofit management degree program. Accreditation proves that a school has undergone a rigorous and independent review process and ensures you receive a high-quality education. There are several types of accreditation, however, including regional and national accreditation. Regional accreditation is typically the most well-recognized and qualitatively rigorous form of accreditation, while national accreditation is usually reserved for vocational and other specialized programs. In addition, there are independent bodies that accredit programs in a particular field, such as engineering or medicine. No specific accreditation boards exist for nonprofit management degree programs, but you should ensure the program you choose is regionally or nationally accredited. For students who have a business focus, it may be useful to ensure your program is accredited by the Association to Advance Collegiate Schools of Business. Regional, national, and specialized accreditation is overseen by the Council for Higher Education Accreditation (CHEA) in partnership with the U.S. Department of Education (ED). To find out more about accredited schools, you can download the latest list of accredited institutions on the ED's website, or search for a specific school using the CHEA school database. Natural disasters and emergencies require directors who can prepare plans and think quickly. Emergency management directors coordinate with state and local governments, elected officials, and nonprofit organizations to bring necessary materials to devastated people and environments. Nonprofits large and small need administrators to navigate the complex elements of multiple divisions. Administrators manage records, maintain facilities, and coordinate office productivity, all while maintaining government regulations and safety standards for the company. As part of a larger human resources team, a compensation and benefits manager oversees how employees are paid and coordinates retirement plans, health insurance, and other benefits offered to a nonprofit's or company's employees. Public relations managers write press releases, coordinate external communication, and design advertising promotions for nonprofits. A fundraising manager identifies and contacts potential donors, applies for grants, and develops fundraising strategies. Social and community managers assess the effectiveness of nonprofit or government programs. They develop budgets, manage community outreach, and advocate for awareness of social issues. They also oversee the provision of services to underrepresented groups and individuals. Financing your online bachelor's degree in nonprofit management may seem like an uphill battle. Even so, many funding opportunities exist, including scholarships, loans, and grants. Be sure to complete the Free Application for Federal Financial Aid (FAFSA) to take full advantage of government funding opportunities including loans and federal work study. Many private scholarships also require you to fill out the FAFSA to qualify for need-based scholarships.